Aristotle develops the Doctrine of the Mean in Book II of the Nicomachean Ethics (NE). The mean is not an arithmetical mean, but a point on a scale between two extreme dispositions which represent the excess and deficiency of a virtuous trait. Aristotle distinguishes between two types of virtue, intellectual virtues which involves choice, knowing a situation and what it demands, but moral virtues refers to that which comes from character. A virtue is something which is learned through practice. 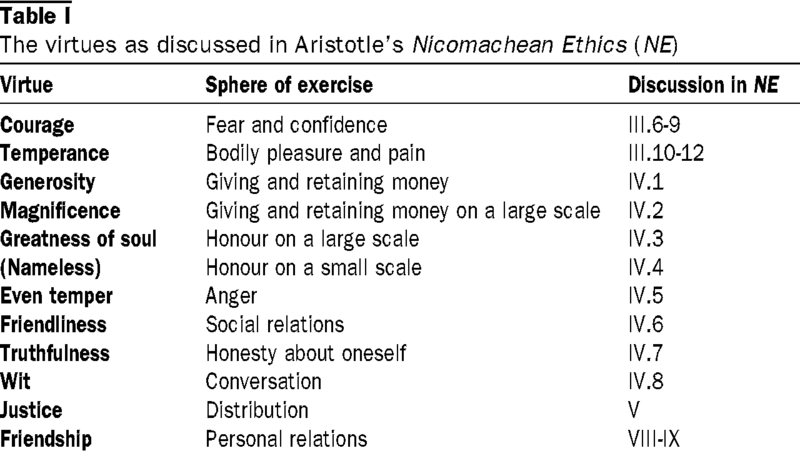 Aristotle discusses a table of virtues which outlines on a scale the virtuous traits. To each of these he describes the effects of excesses or deficiencies of the traits. The mean relates specifically to moral virtues. 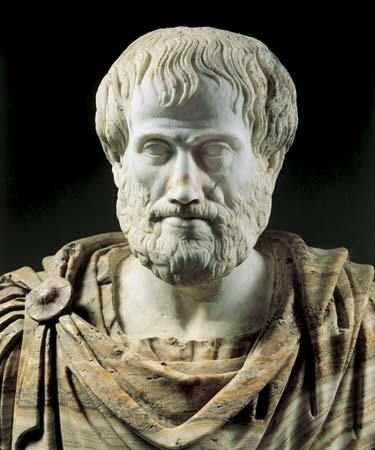 When Aristotle states that the mean comes from moral virtue, the mean is not in the middle of two states. To use the example of courage which is a moral virtue, it is not located directly between rashness and cowardice. The courageous person is not in a fixed position between the two; he acts in accordance to the mean as the situation demands. In essence, it is the capability of acting the right way at the right time. The mean may be nearer to one extreme than to the other, or seems nearer because of our natural tendencies. The mean acts as a guide to moral action. Aristotle states the importance of moral virtues. It is necessary to live in a morally virtuous way to achieve life in eudaimon. Eudaimonia is often translated as “happiness” identified with living in a morally virtuous state. Identifying life in eudaimon is subjective as an individual who lives in accordance to moral virtues cannot be wrong in estimating whether they are happy. Living life engaged in physical pleasure is not virtuous. Physical pleasures and wealth deceive us into unvirtuous activities and behaviours. With the Doctrine of the Mean, Aristotle guides toward living a morally virtuous life through morally virtuous activities. We cannot become consumed in physical pleasure and Aristotle suggests that it is a human tendency to become consumed by it. To develop a virtuous character one must avoid the extreme which is more contrary to the mean.1 We must notice the errors into which we ourselves are liable to fall and we must, in every situation, guard especially against pleasure and pleasant things because we are not impartial judges of pleasure. By following these guidelines we shall have the best chance of hitting the mean. Pleasure is not a happy life although Aristotle does not deny that it is a part of the happy life. A life consumed by pleasure is not a happy life as the human being is not using their faculty of reason. Aristotle describes the differences between classes in that people of a lower class may aspire to achieve happiness through pleasure as pleasure is more difficult to attain than a more „cultured‟ class of people. This ties into Aristotle‟s notion of contemplation being the highest virtue of man, described in Book X. He goes on to explain that moral qualities are destroyed by deficiencies and excesses but preserved by the mean. Pleasure induces us to behave badly and pain to shrink from fine actions. Outlined briefly are three factors that make for choice: the fine, the advantageous and the pleasant. Three factors that make for avoidance are: the base, the harmful and the painful. To be virtuous one must act in a certain state. One must know what he or she is doing; choose it and choose it for its own sake; and do it from a fixed and permanent disposition. “Man becomes just by the performance of just.” The best mean is one which is relative to us. Aristotle goes on to state that the mean is relative to the object. The mean relative to us is not exactly clear and this further distinction of the mean relative to the object needs further clarification in terms of guiding moral action. The mean relative to an object involves an evaluative element. Aristotle previously states the mean as existing on a continuum of excess and deficiency. Bringing in this “evaluative element” allows us to see that the mean is relative to us. The mean is not generalized as a specific course of action to follow in order to act morally.Morals cannot by any means be reduced to a set of universal principles. The “Good” is something that which “all things aim”. The good is the highest of all practical goods and is achieved through a mean. Loosely translated, Eudaimonia refers to an ultimate happiness state. “Ordinary” people identify the “Good” with pleasure or money. „Cultured‟ people identify the “Good” with honour. Honour is seen as the goal of political life. The “happy” man is one who “is active in accordance with complete virtue, and who is adequately furnished with external goods, and that not for some unspecified period but throughout a complete life.” To evaluate “good” Aristotle uses the example of a “good” eye should see correctly, it fulfills its purpose. That is not to say that fulfillment can be equated with ultimate purpose. A “good” should be an end in itself. Human goodness can be equated with human rationality as rationality is said to be a unique quality of humans. A clever person knows the best means to any end. A wise person knows for which ends are worth striving. On the path to virtue, the individual must know what they are doing, choose it and choose it for its own sake and do it from a fixed and permanent position. The individual must have the right feelings at the right time on the right grounds towards the right people for the right motive and in the right way. “It’s easy to be angry, but to be angry at the right time, for the right reason, at the right person and in the right intensity must truly be brilliant.”We can see that Aristotle’s Doctrine of the mean acts as a useful guide to moral action. The merits that the mean gives rise to outweigh the criticisms. It suggests to us that the “good” life consists of an individually acting morally in everyday life to each and every situation. If the courageous individual were to act with the same courageous convictions in every situation, the individual cannot be said to be acting in the mean. Some situations demand the courageous person to act less or more courageous. Aristotle acknowledges this in the doctrine of the mean which other branches of Ethics disregard. We can compare this to Kant‟s argument with the position that one must adherently follow moral duty. The individual may not flourish in their intellectual capacities and evaluate the situation.